Our Konect Global Data Services is a cloud-based application that automatically collects the data from your Campbell Scientific data logger, stores it securely in a database, and provides a variety of data display components so you can view the data that is important for making decisions in your day-to-day work. 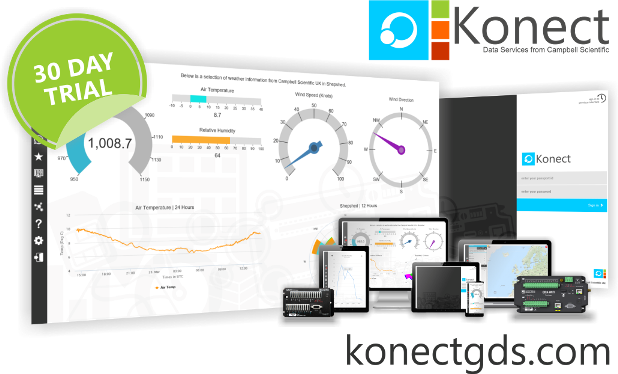 Konect's flexible design layout offers a dashboard view for a powerful representation of your data—whether you are viewing Konect on a large desktop display or checking up on your stations using a mobile device. Konect Global Data Services takes the headache out of your data collection and display tasks by letting Campbell Scientific do the work for you, while you focus on your mission-critical tasks. Visit the Konect Global Data Services website to sign up for a free 30-day trial or to start your Konect GDS subscription today. If you don't have time to develop your own displays, speak with one of our Support and Implementation Engineers about a complete data collection and display solution. 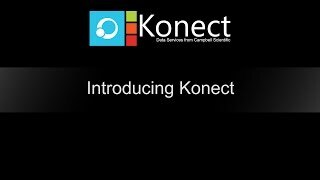 Konect Global Data Services is a cloud-based application for collection and display of data from Campbell Scientific's IP-enabled data loggers. It's built on a solid foundation of Campbell Scientific technology and hosted in a Microsoft Azure environment, so you can rest assured that your collected data is secure and available when and where you need it. Data displays are created by selecting from a list of available components and dropping them on a workspace. Components include a variety of gauges (needle, linear, radial, compass), charts (line, xy scatter, columnar, wind rose), and data elements (data tables, data values). The location of stations can be marked on a map, and important data quickly displayed with a single-click on the station's map marker. The displays employ responsive design technology, which means they resize automatically to look great on any size device. Users of your Konect data display log in under their own username and password, with Admin users having full rights to all functionality in the system. Konect also allows the designation of a data display as a kiosk, so that no user login is required to view the data. Custom queries can be run on a table in the data logger and displayed in a table or chart format. The data from these queries can be exported to a CSV or Excel format. If you need a more automated solution, schedule one or more reports to run and deliver the data directly to you via email or FTP. Subscriptions to Konect are available on a per station/per month basis. A flexible payment plan can be set up for monthly, quarterly, or annual payments. To sign up for a free 30-day trial or to start your Konect GDS subscription today, visit the Konect Global Data Services website. For security reasons, Campbell Scientific recommends using the latest version of a web browser. Use the latest version of Internet Explorer, Edge, Chrome, or Firefox. For Safari, use iOS 10, which includes a necessary compatibility fix. Konect Global Data Services is compatible with any Campbell Scientific PakBus data logger that is accessible via an IP address. 200 metros al Oeste y 75 metros al Sur de la Cámara de Industrias, Barrio Los Yoses, San Pedro de Montes de Oca, edificio de 3 pisos color blanco.